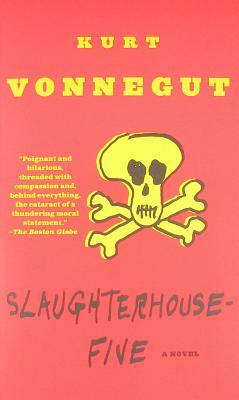 Slaughterhouse-Five, an American classic, is one of the world’s great antiwar books. Centering on the infamous World War II firebombing of Dresden, the novel is the result of what Vonnegut describes as a twenty-three-year struggle to write a book about what he himself witnessed as an American prisoner of war. It combines science fiction, autobiography, humor, historical fiction, and satire in an account of the life of Billy Pilgrim, a barber’s son turned draftee turned optometrist turned alien abductee. Billy, like Vonnegut, experiences the destruction of Dresden as a POW, and, as with Vonnegut, it is the defining moment of his life. Unlike the author, he also experiences time travel, or coming “unstuck in time.” Billy Pilgrim’s odyssey reflects the mythic journey of our own fractured lives as we search for meaning in what we fear most. Kurt Vonnegut’s black humor, satiric voice, and incomparable imagination first captured America’s attention in The Sirens of Titan in 1959, and established him as “a true artist” (The New York Times) with Cat’s Cradle in 1963. He was, as Graham Greene declared, “one of the best living American writers.” Kurt Vonnegut died in April 2007.